NISSUI's genes are alive and continue their ambitious attempts throughout the world. The marine products business is the core business of the NISSUI Group. We have established a system for always supplying safe, secure, and good-tasting fish, where the entire process from accessing marine resources to delivering products (i.e., fishing and aquaculture) to the customer's table, as well as processing and marketing, is implemented in an integrated manner. In addition to the supply of marine products (fresh or frozen fish), we have improved our technology for making the most of oil and fat (fish oil), meal (fish meal and feed for aquaculture), and other marine resources, and are pursuing new values. Recently have been focusing energy on aquaculture in Japan to strengthen the food supply system for the future. 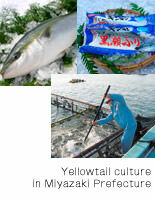 To establish unique aquacultural technology, in 1994 we established the Oita Marine Biological Technology Center, where our researchers are engaged in the study of breeding, fish diseases, and feed with the aim of developing NISSUI's original integrated aquaculture system. The foods business is an engine of the NISSUI Group and operates in conjunction with its marine products business. This segment produces and sells frozen, canned, and bottled food, fish sausage and such fish paste-based products as chikuwa (steamed fish cake) and crab-flavored kamaboko. The NISSUI Group's foods business has grown steadily thanks to its excellent R&D functions, product planning ability, procurement and distribution functions, and processing technology, and also by listening to customer opinions. With globalizing markets, we are striving to build the Global Supply Chain for realizing the synergy of the Group's functions by effectively combining our overseas bases, which are expected to achieve good results in terms of raw materials procurement, production and processing, and market expansion for the future, with our domestic bases that are characterized by their value-added commodity production. 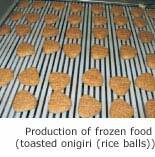 The NISSUI Group's chilled foods business began in the 1980s for the purpose of developing general food products to be kept at a chilled temperature zone. Through this process commodities were developed for convenience stores (CVSs), and Nippon Cookery and other affiliates are now making box lunches, noodles, pre-cooked foods, and other chilled foods for CVSs. Our chilled foods business has the system for meeting the diversified needs of CVSs by its ability to create new products, maintain product quality, and develop production machinery. The NISSUI Group's fine chemicals business has put into practice its corporate philosophy: "Create new value from marine resources using an accumulation of expertise." A typical example is the R&D of unsaturated fatty acids "EPA" and "DHA." A high content of these substances are contained in sardines and mackerel and have the effect of reducing lipid in blood, thus preventing arterioscleroses. NISSUI developed and commercialized high-purity refined EPA as an active pharmaceutical ingredient of ethical drugs in cooperation with Mochida Pharmaceutical Co., Ltd., and has commenced producing "fish cholesterol" and "arachidonic acid" by bio-production, in addition to "EPA" and "DHA" refined for food product ingredients. NISSUI supplies these functional materials as ingredients of additives for baby milk and nutritional supplements and other food products and supplements, and even as materials of cosmetic products in Japan, the West, and Asia. The NISSUI Group includes Nissui Pharmaceutical Co., Ltd., a manufacturer of pharmaceuticals, supplements, culture media, and diagnostic agents primarily made from natural ingredients. The NISSUI Group's fine chemicals business will continue to help enrich the lives of people all over the world. The fishery and food businesses have supported NISSUI's general distribution business, and were unified as NISSUI Logistics Corporation in April, 2007. 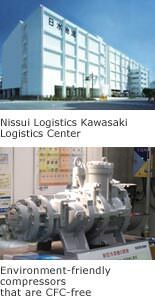 It expends its 26 cold storage facilities throughout Japan and has a role as a global supply chain of NISSUI group. Nissui Engineering Co., Ltd., a member of the Nissui Group, is engaged in marketing of equipment and plant machines used in the food processing-related segment, as well as offering consultancy services regarding production technology based on technologies and human resources that Nissui has cultivated over the decades. Nippon Marine Enterprises, Ltd. is engaged in ocean surveys as an operation to support marine research activities, and its so-called observation engineers, equipped with specialized techniques, are working consistently at addressing new challenges.